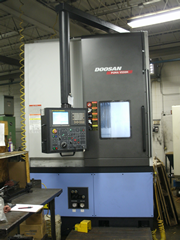 In February 2012 we added a new Doosan V550M vertical turning center with a 49 HP spindle, live tooling and high pressure coolant. It increases our vertical turning capacity to 7 spindles and can turn and mill pieces up to 22 inches in diameter and 20 inches in height. This entry was posted in Machines, News by admin. Bookmark the permalink.